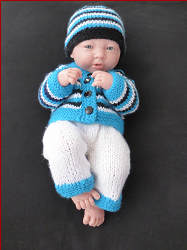 This 8ply set for a 38cm [15 ins] Berenguer Doll includes a Beanie, Cardigan and Pants. 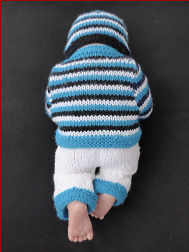 This three colour design will suit either a girl or boy doll. Berenguer doll size: 38cm [15 ins]. Beanie to fit head: 32cm [12½ ins]. Cardigan to fit chest: 28cm [11 ins]. Pants to fit waist: 27cm [10½ ins]. Yarn required: Lincraft DK 8ply, 100g balls@266m. Also required: A stitch holder for Cardigan; 4 buttons for Cardigan; a stitch holder for Pants; narrow elastic for Pants (optional). Tension: 22 sts and 30 rows to 10cm [4 ins] over stocking st, using 4.00mm needles. Stitches used: Garter stitch and stocking stitch.